Just a few addresses (check also lists of restaurants for other countries). A crowded institution but not a tourist trap (that would be Hotel Sacher's Sacher Torte: not very expensive, but far too sweet), Figlmuller boasts a 106 year old Wiener Schnitzel ("Figlmüller Schnitzel gebacken"). 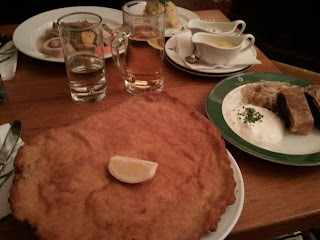 It is the biggest of its kind, like a light pizza, and it does taste good, but it remains a Wiener Schnitzel. I enjoyed the Blunzn-Strudel ("blood sausages-strudel with warm cabbage salad and bacon" - the 'boudin' is at the same time tasty and not greasy, the sauerkraut sublime) and the Tafelspitz ("boiled rump with chive sauce, apple-horseradish and browned potatoes" - a delicate pot-au-feu). You want to make a reservation: the place is so crowded they had to open a second restaurant almost next door. The original (on Wollzeile) is very cute in a picturesque alleyway, the other one stretches even underground and has a more complete menu. A traditional decor, but a more ambitious menu revisiting Austrian classics (beetroot risotto worked just fine). On the verge of pretentious. Few tourists there except yours truly, but I prefered the above mentioned tourist hotspot for the overall experience and quality-price ratio. Next to the Pestsaule (an utterly baroque erection on Graben), this small Hungarian restaurant provides a friendly atmosphere and massive portions of specialities that mercifully also come in smaller packages, but even after skipping lunch we barely managed to finish everything. The beef goulash (with tarhonya / hungarian pasta: Marhapörkölt tarhonyával) has it all, including a quite subtle broth, and the stuffed cabbage rolls (Töltött káposzta) do their usual trick. If you want to try the Brassoi (slices of pork with fried potatoes / Brassói), theirs is addictivingly good, but you may need an eatmate to finish it.